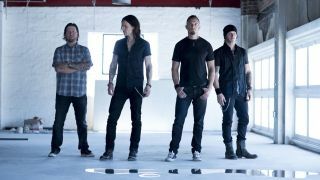 Mark Tremonti says that he and his Alter Bridge bandmates are planning to return to the studio in March. The guitarist was speaking with The Edge Rock Radio's Rockwell Anderson at the end of January onboard the ShipRocked cruise when he revealed the news. When asked what was next for Alter Bridge, Tremonti replied: “We are going in the studio after this tour with Sevendust. The record when it does arrive will be Alter Bridge’s first album since 2016’s The Last Hero, with vocalist Myles Kennedy telling My Global Mind in November that he and Tremonti had “a whole bunch of ideas” for the new record. Alter Bridge released Live At The Royal Albert Hall in September last year, while Tremonti launched a live video for Throw Them To The Lions just last week.